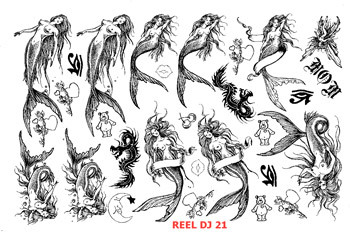 Reel Creations - Item Details for REEL Blood, Dirt, Body Art Pens, Hair, Palettes, Sealers, Tattoos, Stencils and Developers for the Movie Make-up Industry and Beyond. Thinning Blood Products - Liquid Bloods can all be thinned with distilled water. You may need to add red, yellow, blue and/or green food color to maintain density of color. Discard left over blood once this procedure is used due to possible contamination of the product. Or the REEL LUNG, AGED or THICK BLOOD can also be thinned with REEL ORIGINAL FORMULA BLOOD. This procedure should not contaminate product provided sterile cosmetic practices are used. This sheet contains: Mermaids, Pixie Fairy, Rose, Heart, Egyptian Eye, Dragon, 'MOM'. Sold by the sheet only. USE THE SEARCH BOX TO FIND TATTOO OF YOUR CHOICE - example: type in "eagle" to find all the sheets with eagles on them. removed from our mailing list. and does not imply endorsement by actor.